The 100-Day Prosperity Challenge: It's Time for More! 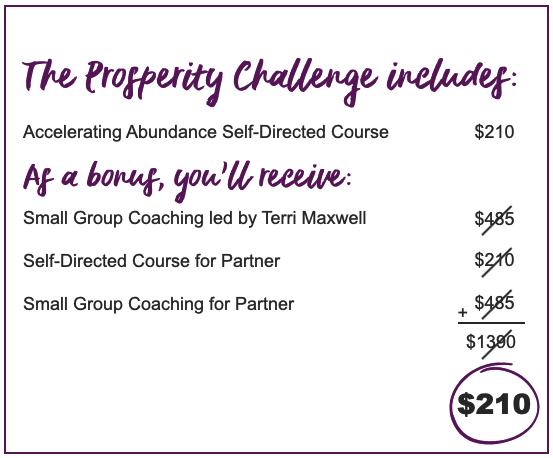 Using Succeed On Purpose's Accelerating Abundance Program, this challenge provides actionable tools for you and a partner - delivered through online training and personal coaching from Succeed On Purpose founder, Terri Maxwell. This program works - and we unconditionally guarantee your satisfaction. How to clearly define your vision - what you want and why. Techniques to overcome fear/doubt and raise expectations to manifest desires quickly. Identify and overcome roadblocks and self-defeating barriers, such as feeling not good enough. Planning guides to accelerate results. You can have more success, more joy, more meaning AND more money! If you’re looking to have more in any area of your life - whether it be career, business or personal - we invite you to join the 100-Day Prosperity Challenge. You will be coached through the challenge utilizing the Accelerating Abundance Program. In this 7-Module Course, you’ll learn to transform the energy you put into life and improve the speed with which you attract abundance. Use these tools to manifest what you want more effortlessly. You'll be given access to online training to review and revisit at any time. As a gift, you'll also receive weekly coaching from Succeed On Purpose Founder, Terri Maxwell. Coaching will be live and interactive, delivered online in a small group setting. It's time for impactful, soul-stirring abundance in every dimension of your being (especially money). Step 1: Purchase the Accelerating Abundance Self-Directed Course. Step 2: Watch for an email to access the Self-Directed course and schedule Coaching. You’ll also receive a code so you can gift these programs to a friend. Step 3: Share the code with the person you’ve chosen to partner with, so they can purchase Accelerating Abundance at no charge. Step 4: Begin the 100-Day Prosperity Challenge and make 2019 the most abundant year ever! Since collaborating with a partner will dramatically accelerate results, we're also giving you a buy-one-get-one-free coupon so you can share the same programs as a gift ($1,390 value for $210).